Adam Lefkoff sits on a gray banquette in the lobby of the David L. Lawrence Convention Center in Pittsburgh. His hands rest contentedly on his slight paunch and his face beams beneath the brim of his white baseball cap. Were it not for the waves of people approaching him and his 14-year-old son Escher, he’d be virtually indistinguishable from the 100 or so other pear-shaped men ambling through the lobby, waiting for the Pinburgh Match-Play Championship to begin. “Let’s play a drinking game for every time someone compliments Escher on his PAPA championship,” Adam jokes. 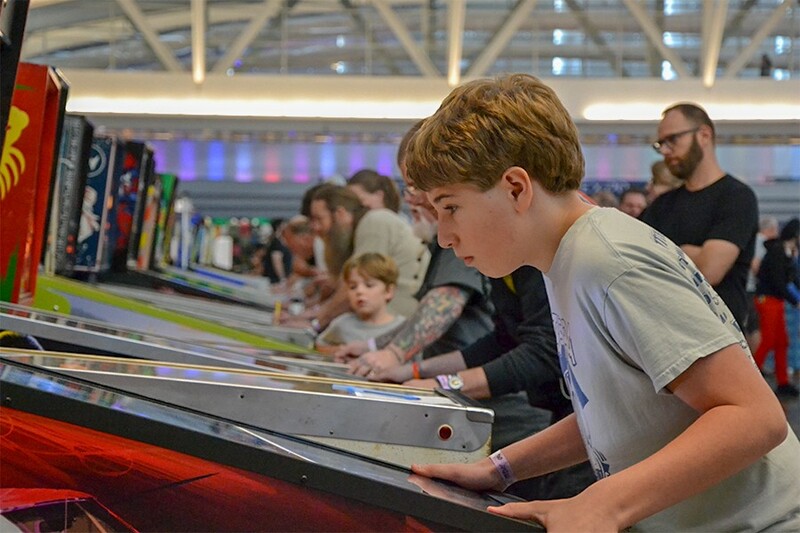 Three months ago, Escher defeated a tournament field of hundreds of men and women, many of them more than twice his age, to win the Professional & Amateur Pinball Association (PAPA) world championship. 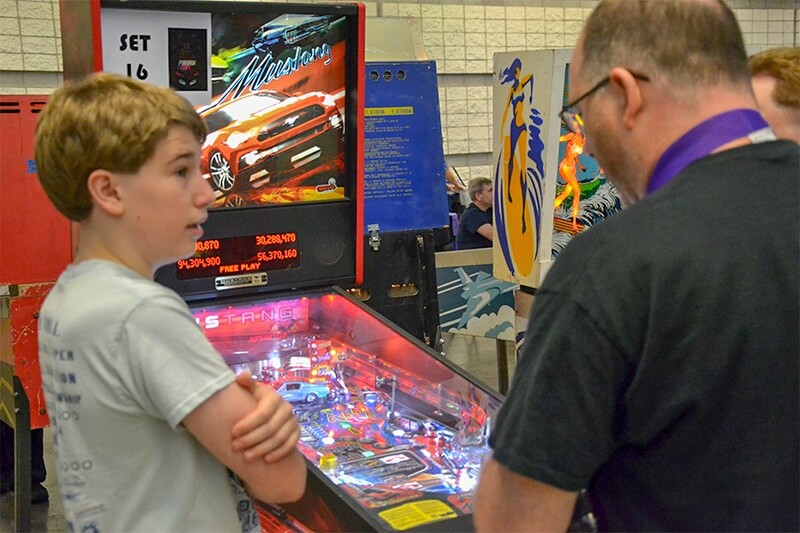 Widely considered one of the most prestigious pinball tournaments in the world, the victory has meant a brush with mainstream fame, and legitimate renown within the insular confines of competitive pinball. A boy about Escher’s age rushes up to him, a friend following closely behind. “Escher, I want to introduce you to Addison,” he says. “He really wanted to meet you.” The younger boy nervously extends his hand, which Escher shakes with a practiced formality. It’s the kind of recognition Adam, a competitive pinball player in his own right, once imagined for himself. “Now that I’m ‘Escher’s dad,’ people I don’t even know will come and say hi,” Adam says of the men greeting Escher in the lobby. But the reputation presents an unfamiliar dilemma for Escher. He enters this weekend’s tournament the 49th ranked pinball player in the world, a personal best, and bearing the heavy crown of defending world champion. 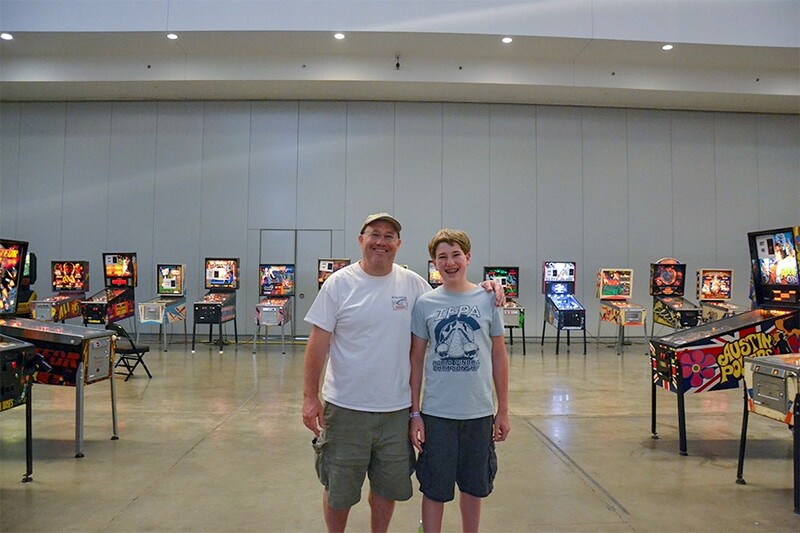 Fail to qualify for the final round here at Pinburgh — either the first or second most important event on the competitive pinball circuit, depending on where you rank it relative to PAPA — and his previous win can be dismissed as a fluke. But replicate the performance, and he’s merely living up to expectations. For now, though, the crowd is cheery. 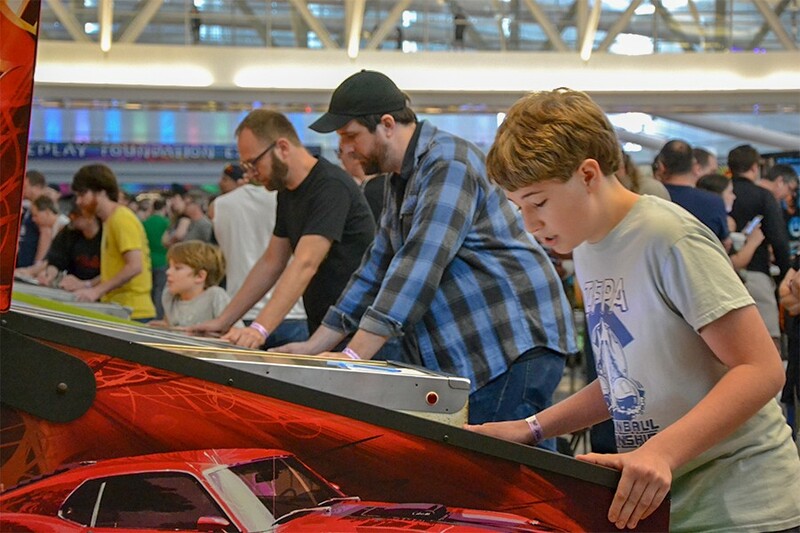 None of them have been crushed by the maddening frustration of pinball yet, and the tournament holds nothing but hope and promise — not to mention more than $100,000 in cash prizes, $15,000 of which goes to the overall winner. “As the day goes on, there will be lot less laughing,” Adam says. Escher stands next to a middle-age man, emphatically trying to school him on how to activate the the hidden ramp in Jokerz, so that the man might achieve the 4-million jackpot. “First, you have to hit the center targets. And then you shoot the ramp and it’s 4 million,” Escher says. The man says nothing. He crosses his arms and frowns, and avoids Escher’s doe eyes and stares off at some unidentified recess in the enormous convention center. 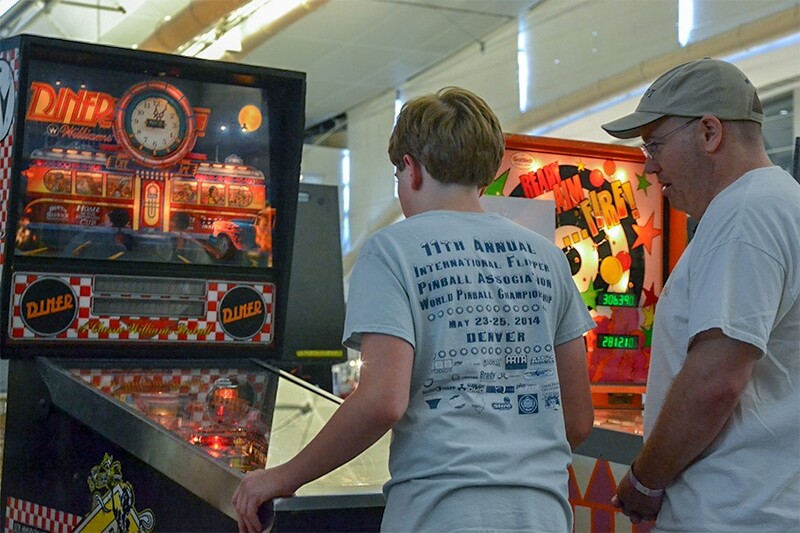 Competitive pinball is as much about knowing the unique scoring mechanics of the machine you’re playing as it is about reflexes and shot accuracy, and in that respect, Escher has a massive advantage in the form of his father’s encyclopedic pinball knowledge. The advice Escher is currently dispensing is nearly identical to the tip his father gave him 20 minutes ago, just before the tournament began. Escher was foiled only when he activated the Springfield Mystery Spot, a multiball mode that inverts the flipper controls — i.e., the right button controls the left flipper, and vice versa. It’s recommended players cross their arms over the machine such that their hands are on the opposite flipper buttons so each hand can control its rightful flipper. But Escher couldn’t do it; his arms were too short. 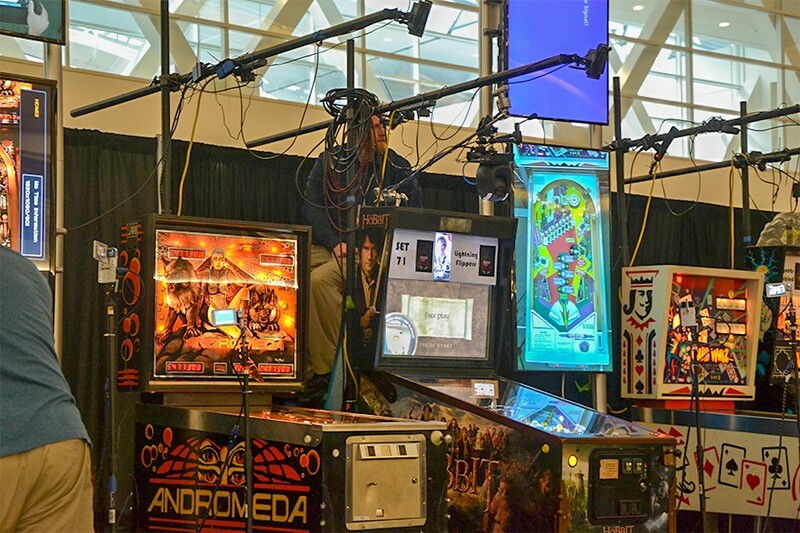 After Jokerz, Escher’s group proceeds to the pinball machine inspired by The Walking Dead. Amateur players tend to attack the bash target in the middle of the playfield (in this case, a fat, especially decrepit zombie who’s fallen down a well). Escher, however, methodically hits the trio of drop targets on the left side of the playfield, activating Blood Bath — where every switch is worth 15,000 points — before initiating the Prison and Well Walker multiball modes and registering a stupefying 250,000,000 point ball. It all leads to his second first place finish in as many games. The frustrated middle-age man stares on in silent disbelief, while another in Escher’s group shakes his head and mutters, “That was a great ball,” to no one in particular. On Day Two of the tournament, Adam walks away from a row of pinball machines. He kicks at the concrete floor, grumbling to himself about his poor play. Adam is competing in Pinburgh, too, meaning he can’t be around to watch Escher play, which is fine by him. “It’s nerve-racking watching Escher play — not for him, but for me,” explains Adam, who like Escher, is among the top 100 ranked pinball players in the world. 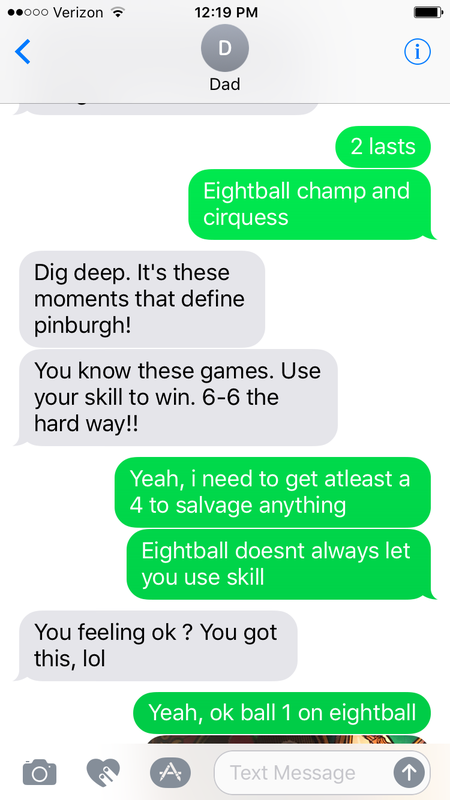 “Plus, he does better when I’m not around.” Instead, they communicate via text message through the tournament, Escher sending his father updates after each ball and Adam responding with votes of confidence. 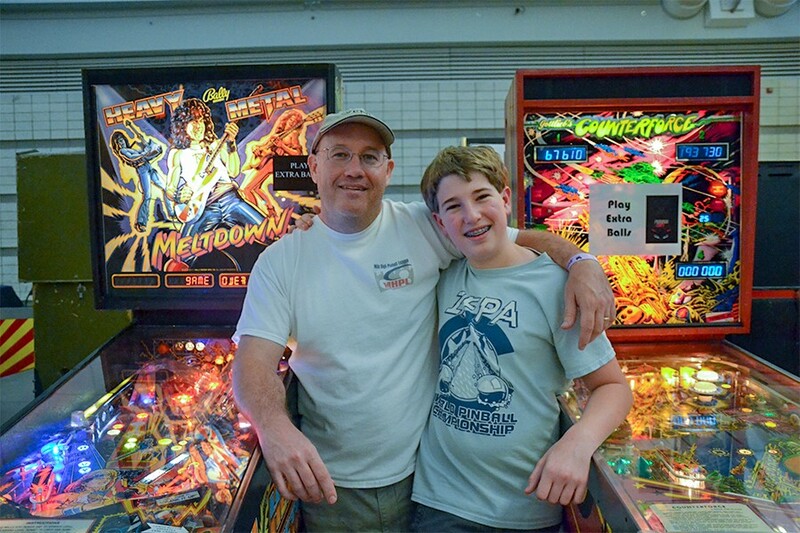 Soon after outfitting his Colorado home with pinball machines, a pinball emporium, Lyons Classic Pinball, opened nearby, and he met a pinball king by the name of Donavan Stepp, a top 50 player in the world. He was the guy who introduced Adam to the world of competitive pinball. “It just blew my mind. I didn’t know you could play that way,” Adams says of the first time he saw Stepp play. Their introduction triggered a latent competitiveness in Adam. Adam had discovered rugby in college (and loved it), but he didn’t fully grasp the intricacies of the game until he was 35 and well past his physical prime (he has a herniated disc in his back and two pins in his left heel). “That’s when I started playing pinball, because I needed the rush of competition,” Adam says. Adam dreamt about becoming the kind of champion-caliber competitor Escher is now, but soon realized that goal was out of reach. “Like with rugby, I got into [pinball] when was I too old to compete at the highest level,” Adam says. Pinburgh is on its midday break, and through two rounds, the Lefkoff boys have been dominant, with Adam currently tied for 9th place overall, and Escher close behind at 18th. Escher settles into a booth at Ten Penny, the corner gastropub across the street from the convention center. I ask him to name his favorite pinball game, but he refuses. “My favorite game is whichever game is next,” he answers. After a little coaxing, however, Escher begrudgingly admits he prefers Game of Thrones, even though he’s never seen the show. “I’m not allowed to watch it,” he explains. “He has not seen Game of Thrones,” Adam reiterates, sternly. “I’m a bit frustrated right now,” Escher admits. Normally, Escher speaks with a smile that’s too big for his face. He grins so wide that it forces his eyes shut into a squint. But now his face is pure worry. He entered Day Two of the competition in the top 50 and in excellent position to qualify for the finals tomorrow. But after an abysmal first round, he’s dropped to 82nd and that’s suddenly in jeopardy. In that sense, Adam views his son’s struggles as a painful but necessary experience. Because no matter how much you practice, no matter how refined your flipper accuracy or deep your game knowledge, pinball will still forever be a game of chance. The ball will seemingly defy physics when ricocheting through the playfield, or will drain perfectly down the middle gap, leaving the player no chance to save it. Escher rebounds nicely in round two, coming in first for his group, but catastrophe strikes in the next round. The game, Ready Aim Fire, malfunctions, awarding Escher 10,000 points every time he hits the left flipper. But rather than take advantage of the unearned points, Escher does the sportsman-like thing and alerts an official. In trying to replicate the error, though, Escher triggers the game’s tilt mechanism and loses his ball. The official refuses to grant Escher a do-over, citing a bylaw that states gameplay was never officially paused, and that whatever happens in gameplay is final. Still, Escher collects himself and saves the round with a second-place finish on NBA to avoid a disastrous no-win round and keep himself within striking distance of the top 40. “I got screwed,” he tells his dad afterward. “I didn’t have anything like this with my father,” Adam says before the finals round starts. “He was a lawyer who worked a lot.” Adam’s mother drove him and his siblings to the original 13 colonies for the U.S. bicentennial in 1976, but his father stayed home. Adam’s energy is at a fever pitch as he readies himself to watch Escher compete in the finals. Whatever Escher channeled at the beginning of the tournament returned to him late yesterday as he climbed from 98th in the last two rounds to make it into the top 40 and qualify for the final round today. “I’m not a one-hit wonder,” Escher says, relieved, after hearing he qualified. Adam is careful not to put too much pressure on his son. In two weeks, Escher will start his freshman year of high school, his first time attending classes with the general population after being homeschooled for the past two years, and he’s nervous about his peers finding out about his pinball wizardry. (Escher’s parents pulled him from traditional schooling in the seventh grade, due to some minor bullying and Escher feeling “very stressed out” about the academic rigor of the prep school he was attending.) People tend to either be dismissive or snide when he tells them he’s a master pinball player, so he’d rather not advertise it. “I prefer to just be a kid,” he says. Escher’s future beyond high school, however, is uncertain. 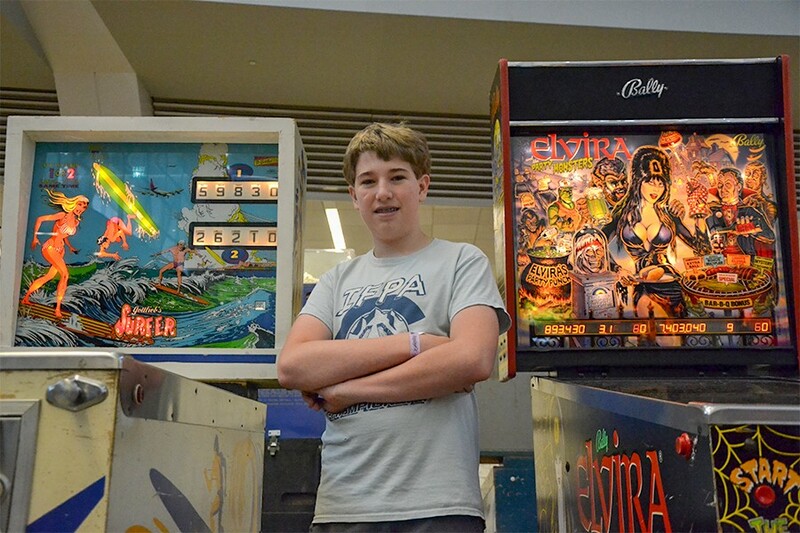 The current plan is to attend college, but he’s already making money playing pinball, and one wonders whether, with his skill and charisma, he can turn playing pinball into a profession. After all, Joe Said, founder of pinball awareness organization Pinball EDU, believes the pastime could follow the same trajectory as competitive video gaming and become a multi-billion dollar spectator sport in the future, with the top “athletes” earning millions per year between competitions and streaming. But that’s far in the future. The present is all about the Pinburgh finals. And things aren’t going so great. In fact, Adam can’t watch as Escher struggles throughout his first three games in round one. He’s not completely out of it, however: He can advance with a stellar performance on the last machine. “Escher’s tournament is going to come down to Card Whiz, a game 20 years older than he is,” Adam says. It’s not to be, though. He’s quickly eliminated when all three balls drain before he can activate the lucrative bonus targets. Dejected, Escher hugs his father. But the dejection doesn’t last long. A few minutes later he and Adam are laughing while walking the convention floor. They even stop to play the various pinball machines on display. Only this time, it’s just for fun.